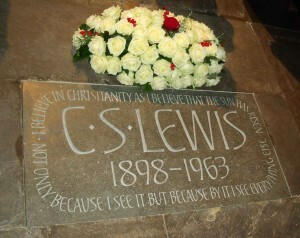 Ten members and friends of CLIS joined several hundred worshippers at Westminster Abbey on Friday 22 November 2013 for a memorial service and the unveiling of a stone memorial to the writer C.S. Lewis in Poets’ Corner. The service was held on the exact fiftieth anniversary of the death of Lewis and was the culmination of many Lewis-related events held during the year including our own public lecture held in Oxford during October 2013.
introductory remarks from the Dean of Westminster, the Very Reverend Dr. John Hall, who explained that the service was to commemorate Lewis’s life and his achievements as a scholar, writer, Christian apologist and the author of stories that have inspired the imagination and faith of countless readers and film-goers. Bible readings from Isaiah 35 and 2 Corinthians 4, read by Dr. Francis Warner, C.S. Lewis’s last pupil, and Professor Helen Cooper, Professor of Medieval and Renaissance English at the University of Cambridge, a position held by Lewis himself between 1954 -1963.
a passage from The Last Battle, read by Douglas Gresham, Lewis’s stepson. a recording of Lewis’s own voice from Beyond Personality: the New Man, the sole surviving recording from his famous series of wartime radio talks for the BBC. prayers led by members of the Abbey clergy and others with a link with C.S. Lewis , including the Chaplain of Magdalene College, Cambridge, the Professor of English Language and Literature at the University of Oxford, and the Vicar of Holy Trinity Church, Headington Quarry, Oxford, Lewis’s parish church. an address by Dr. Rowan Williams, former Archbishop of Canterbury and the author of a recent book on Narnia. His theme was the abuse of language, and as someone who first encountered C.S. Lewis through his science fiction trilogy, I was pleased that the address placed particular emphasis on this series of books. Lewis shared with George Orwell a suspicion of and an aversion to the use of jargon and inaccurate language. In Out of the Silent Planet, Professor Weston’s rationale for colonising the planets and subjugating the inhabitants becomes comical when translated from English into the native Martian language. In the banquet scene that occurs towards the end of That Hideous Strength the skills of language and intelligence desert the speakers but we only slowly realise that they are speaking nonsense. Attempts to make human beings “more than human” leave us profoundly less than human. In Perelandra Weston becomes the Un-man, “a demonised, diabolical figure”. Lewis’s later novel, Till We Have Faces, speaks about uncovering ourselves to the truth to the point where questions fall away. Lewis stresses that if we only think about ourselves we will stay in our self-made prisons. We need to be re-connected with the real world and accept the gift of Jesus. Dr. Michael Ward, Senior Research Fellow at Blackfriars Hall, Oxford, formally asked the Dean and Chapter of the Abbey to take safe custody of the memorial. The Dean replied with a dedicatory blessing and Walter Hooper, trustee and literary advisor to the C.S. Lewis estate, laid flowers on the stone. It was fitting to remember Lewis in the Abbey where over three thousand men and women of Britain and the wider English speaking world are either buried or memorialised. 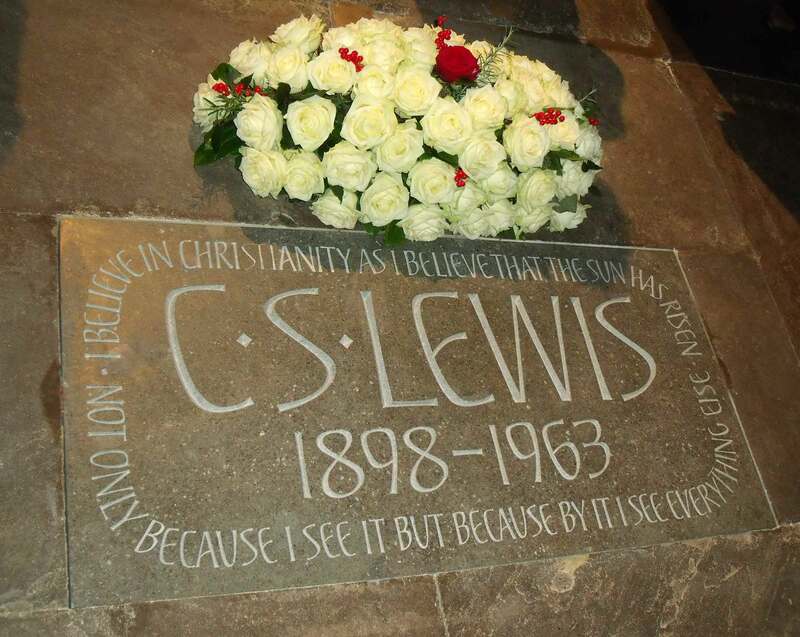 Members of the congregation were invited to pray that scholars, writers and apologists would be inspired by Lewis’s example and that his work would continue to exercise an influence for good on young and old alike.